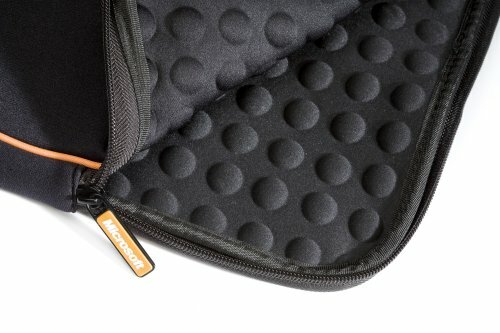 Neoprene sleeve designed to protect a 15.4" laptop when carried alone or in your backpack, messenger or bag. Thick neoprene material is lined with molded EVA material. This lightweight bag is water-resistant with double zippers and carrying handles. Protective, padded sleeve holds most laptops up to 15.4". Machine washable, durable weather resistant neoprene. Dimpled foam interior provides superior shock absorption without additional weight. Fits like a glove to protect against bumps, dust and scratches. This item says it is for a 15" screen, but I am using it on a Hp dv5000 with a 17 inch diagonal screen. It is a very snug fit, which is exactly what I was looking for. The only down side is that the fit is so snug that the power cord does not fit inside with my computer being bigger that the reccomended size. The way I am using it though, I just carry the computer and sleeve inside another bag anyway, so I have no problem keeping the cord outside the sleeve. The sleeve is very low profile and adds very little bulk while providing a good amount of cushioning. This is a very good value for what it is. ***Upsides: A good way to protect your laptop or notebook while carrying it inside another bag. Low profile, reasonable cost, good durability, good cushioning. Allows for you to safely carry your computer inside virtually any other bag. This case replaces my homemade case that I used for well over a year. I've shied away from most cases since I'm uncertain they really offer the amount of padding I want, and although this one still doesn't offer a lot of padding along the edges and corners it will work for me. This case is also large enough to fit accessories -- charger, laptop mouse, plus some other small items -- in addition to offering a comfortable fit for my over-sized battery (I think it is a 9-cell). * Insufficient padding on edges/corners. Like the other reviews here, my experience with this sleeve is very positive. It fits my HP Pavillion dv6500t 15.4" laptop perfectly. The build quality is good. In fact, it effectively qualifies as a basic laptop carrying case as well. Fits like a glove and a great price. I spent quite some time looking for a laptop sleeve that was sturdy enough to use alone and had handles. This is by far the best product I've seen. It is super lightweight and feels more sturdy than other products (thanks to the "dimples"). It even holds a book with my 15.4" laptop. The orange trim adds a stylish touch. Even Fits Dell XPS M1710 17" Laptop! I bought this for my Gateway laptop with 15.4" screen and it fit perfectly. I put my laptop into this and then put it into my backpack. I really like the handles, because I can easily take around my laptop with it. The padding seems very sufficient and I haven't dropped it yet. You will not be able to stick your power cord or even a mouse into this comfortably together with your laptop. You can stick some earphones and some papers or documents into it with your laptop. This has been particularly useful for me on air flights, since I can put all I need into this one sleeve. Most of the time, airport security doesn't even require me to take my laptop out of this sleeve.